Jarno and his angling companion decided to begin their Thailand fishing holiday with a visit to Khao Laem Dam in Kanchanaburi province. After a long journey deep into the national park the angler arrived and were transported to their floating bungalow accommodation. An early start saw the anglers transported to various areas in a long tail boat in search of the elusive Giant Snakehead. After losing a small fish early in the day Jarno was first to score landing a nice Giant Snakehead of possibly 3kg. Fishing proved difficult as the day wore on with only a few small fish to show for their efforts. 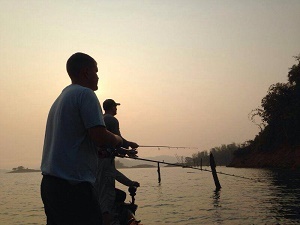 The second day of the Khao Laem Dam snakehead fishing trip saw the anglers once again making an early start. After visiting several different potential holding areas the anglers settled down to fish a submerged forest. This location looked like a perfect holding area for any native predator species with cover and safety offered by the sunken forest below. 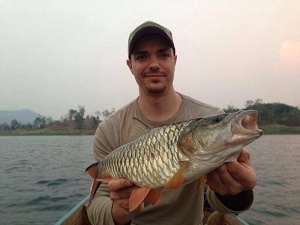 On this occasion both anglers landed several Hampala Barb or Jungle perch throughout the day to 3.5kgs. Once again the Giant Snakehead were conspicuous by their absence. 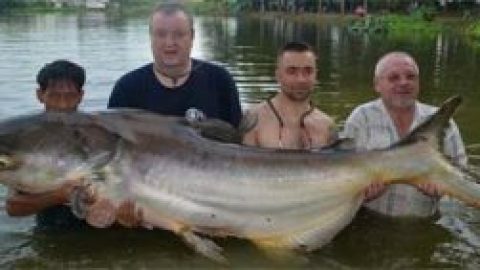 Later in the afternoon one of the anglers lost a better sized Giant Snakehead which managed to spit the hook in the fianl stages of the fight.